After a few days of doing farm work, I was in desperate need to be in the mountains. My buddy was in need of some time in the alpine as well. 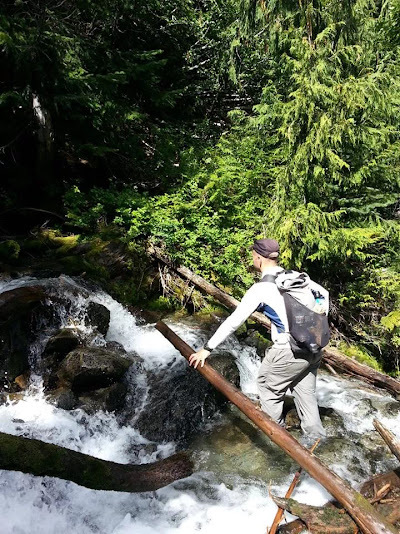 So we set off for a full day's adventure, with the intent of walking up Grand Valley, bushwhacking the 'dogleg' to Lake Lillian and finish loop on the Lillian Ridge Traverse High Route. We calculated 12-14 hours of walking to complete the day. Ended up not reaching the lake this day, because of passing our 'turnaround time'. Losing a lot of time in slide alder and very steep terrains in Lillian Valley. Come to find out, we dropped to low into the abyss of the drainage. Won't go down there again, not fun. Also, personally will not attempt this area without overnight kit, not worth the walk, if you cant stay the night. Dropping into Grand Valley from Lillian Ridge. Ran into @backpackin4ever from Twitter. McCartney Peak & (sliver) Lake Lillian. Destination for our 'dog leg'. Me, dropping into Lillian Valley (dont do this). - photo by Torry J. Crossing Lake Lillian outfeed (dont go here) - photo by Torry J. After turning around and calling it a day, decided to walk in the Lillian River and avoid backtracking in all the Slide Alder. This worked out well. Showing my 'Type II Fun' sadface. - photo by Torry J. After climbing out of the hole, looking toward Moose BM. Walking across the summit of Moose BM. Mount Anderson hides behind Cameron Pass. Clouds from below, try to move in. Descending to the 'spine' section. There isn't very much information on the web about navigating over to Lake Lillian. Some say you can follow the abandoned Lillian Glacier Trail, but I'm yet to see it with own eyes. Most directions are hear say, on an 'easier' route over. 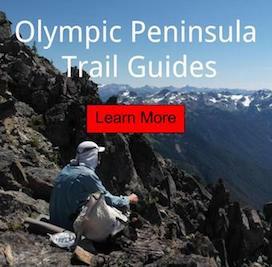 Olympic Mountains Climbers Guide also has a description, but I find their route detail; not to be idiot proof. I plan to make it more documented, so that others don't go through all the slide alder hell; as we did. 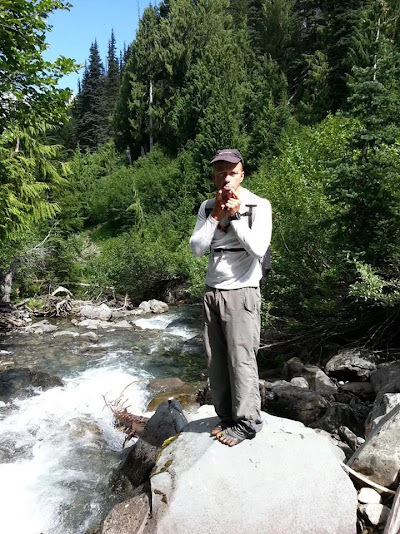 Update: I later returned several times, to hike two variations over to Lake Lillian. Chose not to publicate the directions, for the sake of impact to this fragile area. 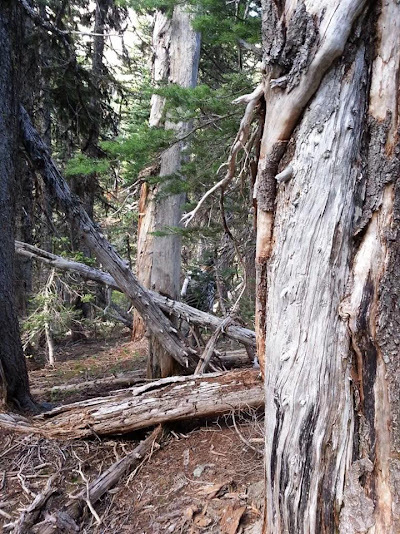 Be sure to review my Day Hiking Gear List, before heading into the backcountry.